Salam Kemerdekaan to all Malaysians. Malaysia is celebrating its 55th independence today. 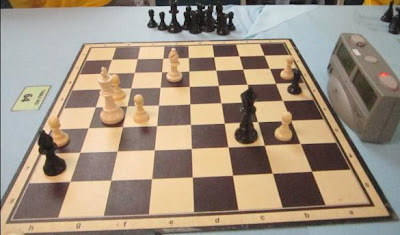 Last night during the eve of the country's independence night Malaysian chess community must be joyous and proud when their chess heroes and heroines fought hard on the chess board over higher-rated opponents and had very commendable results. The Malaysian women chess squad managed to defeat the 64th seed Bolivia with the score of 3 to 1. Its second board player, Nur Nabila, stole the crucial winning point after she won against her higher-rated Bolivian WIM opponent. Both Mi Yen and Li Ting scored 2 important points earlier for Malaysia to make it 2 Malaysia, 0 Bolivia. After Najiha could not seal the victory for Malaysia, the burden went to her elder sister. GiLoCatur, as well as other Malaysian enthusiasts, was quite nervous to follow Nabila's game. Surely, it was a cheerful night for Malaysians when finally the game was over with victory for Nabila playing black. Syabas and tahniah to the Malaysian women's team. It was a double joy for Malaysian chess followers since the two Malaysian IMs of the Malaysian men's squad playing in Round 3 last night against the 37th-rank Egypt won their respective games. Both IM Mok and IM Yee Weng won against their respective 2600-rated Grand Master (GM) opponents. Ofcourse, the Malaysian chess community hoped that a miracle to happen for the other two junior Malaysian men's team members - Li Tian and Zhuo Ren, to provide the important half point to seal the victory over the stronger Egyptian team. Unfortunately, both could not follow their seniors to have magical wins. Thus, Malaysia could only draw 2 - 2 with 37th rank Egypt. Well done boys! It is still an excellent result and performance. In Round 4 tonight, Malaysia will face much tougher and stronger opponent, Moldova which is ranked 41st in the women section. While in the open's section, the Malaysian men's team will play against Finland. Best of Luck to both Malaysian teams. Eight teams have full six match points up to Round 3. They are India, Czech Republic, Slovakia, France, Serbia, Russia, Poland and Argentina. These eight nations are in the top four tables in the fourth round in about two hours time. The first round of the 40th Istanbul Chess Olympiad is over. Most higher-rated teams have no problem thrashing their respective lower-rated teams. But there a number of upsets when few lower-rated players either win or draw against their respective higher-rated opponents. It does not happen to the Malaysian women's team but gladly it happens to the Malaysian men's team who was playing in the top 10 boards. 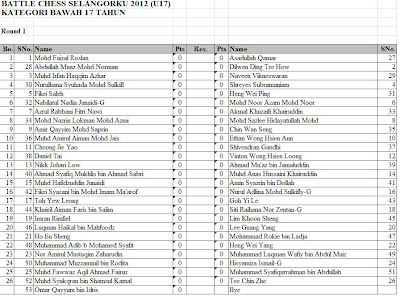 Syabas and tahniah to both IM Mok and NM Zhuo-Ren for their achievement in the first round. Mok who is seeded 363rd and rated at 2354 managed to win against the 41st seed, super GM Van Wely of Netherlands who has International Ratings of 2691. Meanwhile Zhuo Ren who is the 555th seed with ratings of 2120 managed to draw with his 84th seed opponent, GM Stellwagen, who is in the 2600-ratings club. It means Zhuo Ren's opponent has more than 500 rating points than him. Hopefully, all the Malaysian players can have more excellent results like this. The Malaysian lady's team only managed to grab 1/2 points from its opponent, Slovakia. Li Ting who is seeded 406th among the total of 600 plus women players and with ratings of 1834 drew with Slovakian WIM Alena Mrmova at the fourth board. WIM Mrmova is ranked 137th. Surely, a draw against 400-rating- points opponent is a good news for the Malaysian chess community. So, which team will be the next opponent for the Malaysian young ladies in Round 2 tonight? The answer is JAPAN. Malaysia and Japan will have the battle at table #43. Japan is seeded 104th with rating average of 1569. Even though Malaysia is seeded higher than Japan, DO NOT UNDERESTIMATE AND UNDERRATE the opponent. Anything can happen because every player has syrely been making preparation to play in the Chess Olympiad. Let's get to know with the Japanese team members. What GiLoCatur found about the Japanese women players in the 40th edition of Chess Olympiad from Mr Google are as the following. The Japanese women's chess team consists young and veteran players. 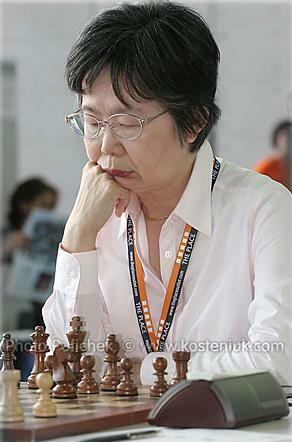 The team's veteran and experienced player is its second board player, WCM Emiko Nakagawa. 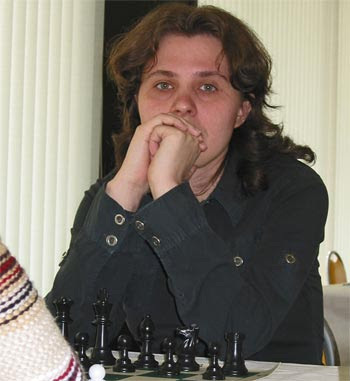 She is making her 13th appearance in the Chess Olympiad. She may be the oldest participant too since she is 70 plus years old. She was born before the Japanese occupation in Malaya. In chess, age is not a factor. This can be a motivation to the Malaysian chess community especially to Ilham who dreams to become a GM by 58 years old. Emiko had won the Japanese national women championship six times. Emiko once had the International Ratings above 2000. So, she shall not be underestimated even though her current rating is 1798. Najiha's most probable opponent is Mirai Ishizuka. GiLoCatur believes she is a bit well known to some of the Malaysian chess players especially BadBishop and Ilham. Both had played against her in 2008 AmBank Chess Challenge as narrated in their respective blogs here and here. As per GiLoCatur's research, there are two young players in the Japanese chess women squad. They are Karen Hoshino and Arisa Kikuchi. The former is just 11 years old while the latter is the same age as Anis Fariha, GiLoCatur's daughter which is 14 years old. Arisa made her maiden appearance in the Chess Olympiad in Khanty-Mansiysk two years ago like Nabila and Mi Yen. 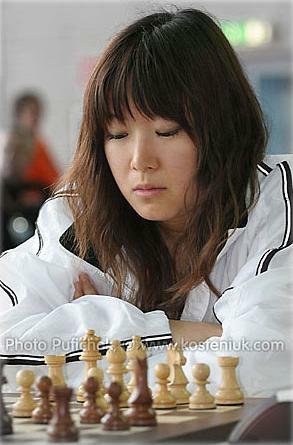 The last member of the Japanese women's chess team is Emi Hasegawa. Not much info about her except she was born in 1979. Click here to view Arisa's games in the 39th Chess Olympiad. 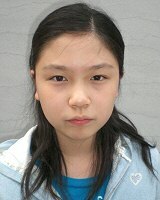 Lots of Emiko's games can be found in 365chess.com and chessgames.com websites. If you are interested to see Mirai's games in 2006 37th Turin Chess Olympiad, go to this link. So, to all the Malaysian chess enthusiasts especially the juniors, if you have nothing to do tonight you may follow the battle between Malaysian and Japanese women chess players online. Don't just waste your precious time facebooking and playing online games. About six hours to go before the kick-off of the 40th Chess Olympiad held in Istanbul, Turkey. Round pairings has already been published. GiLoCatur can't wait to find out the results of the first round especially the Malaysian teams, both men and women. GiLoCatur hopes that each Malaysian women chess player will play her heart out when facing the Slovakian team. Do not be afraid. Study and research respective opponents' games. Keep in mind that a Malaysian player can beat a Slovakian opponent as been proven before. Below are the Slovakian opponents that Najiha, Nabila, Mi Yen, Li Ting and Camilia will face. Check it out! 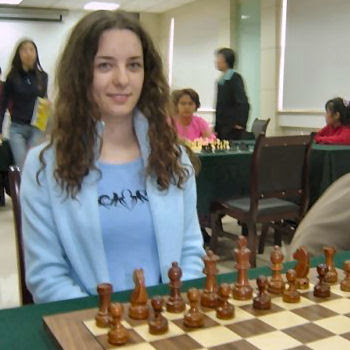 If you are interested to see and learn Zuzana's chess games, please go to 365chess.com website at this link and chessgames.com website here. 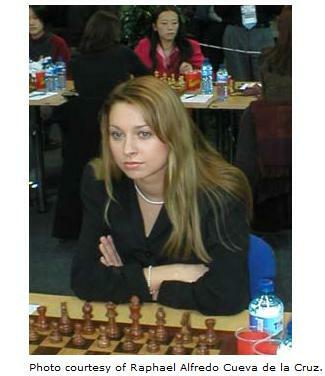 From the 365chess.com website at this URL link GiLoCatur can view the chess games of Veronika. Surprisingly, GiLoCatur found a chess game between her and a top Malaysian woman chess player played in 2005. 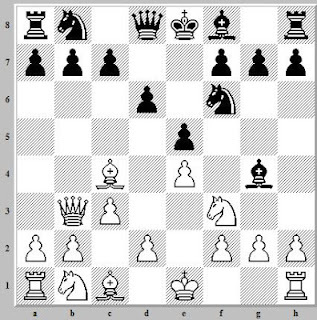 GiLoCatur found that Regina likes to play Ruy Lopez and Sicilian repertoires as shown by the statistics in the chessgames.com website here. Most probably Regina will play against Nur Nabila at the second board provided that Zuzana plays in the MAS vs SVK match up. SELAMAT BERJUANG SERIKANDI CHESS MALAYSIA! 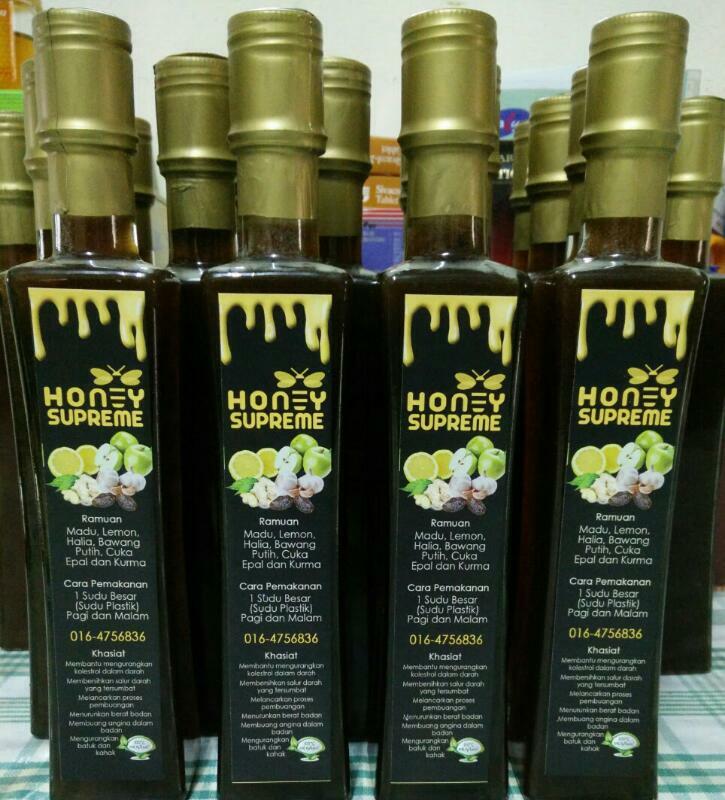 YAKIN MALAYSIA BOLEH! Salam Eidul Fitri. Selamat Menyambut Hari Lebaran. 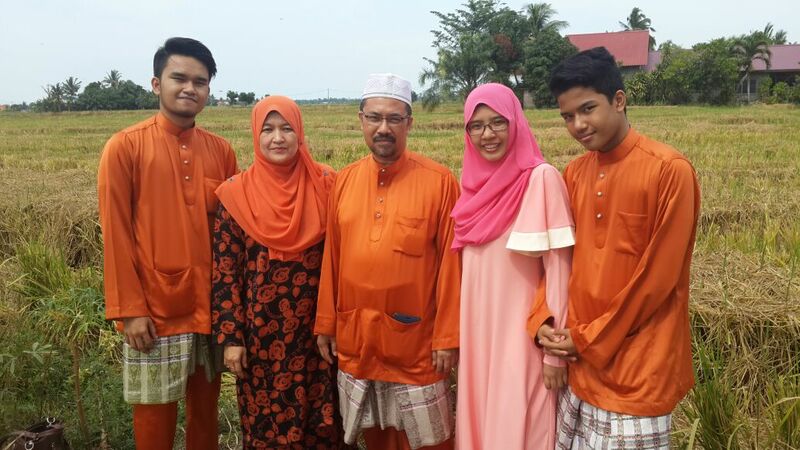 It is the tenth day of Hari Raya Aidil Fitri celebration. GiLoCatur came back from the festival holiday three days ago. Even though GiLoCatur and the kids did not participate in the Malaysian Chess Festival, GiLoCatur followed the chess event whenever possible. In fact, GiLoCatur also checked the results of three Malaysian players who took part in the just concluded World University Chess Championship held in Portugal. And for sure, GiLoCatur as well as most Malaysian chess enthusiasts will follow the World Chess Olympiad which opening ceremony in Istanbul is taking stage at this moment. Fortunately, the games will not be played in the wee hours like the opening ceremony. All the round matches except the final one will kick of at 3 o'clock local time which is five hours later than the time in Malaysia. It will be 8 o'clock Malaysian time. Who are playing for Malaysia in both the Women and Men teams? What is the starting rank? In the women section, Malaysia is represented by the Azman Hisham sisters - WFM Nur Najiha and WCM Nur Nabila, WCM Fong Mi Yen, NM Tan Li Ting and Camilia Johari. Three of them will be playing their maiden Chess Olympiad while the other two are making their second appearance. 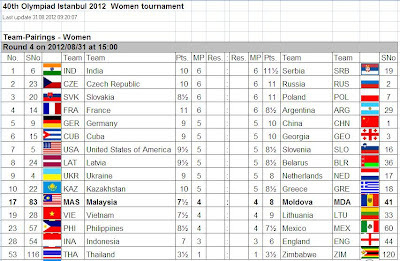 The Malaysian women team is ranked 84th from the total of 129 teams with 1878 rating average. 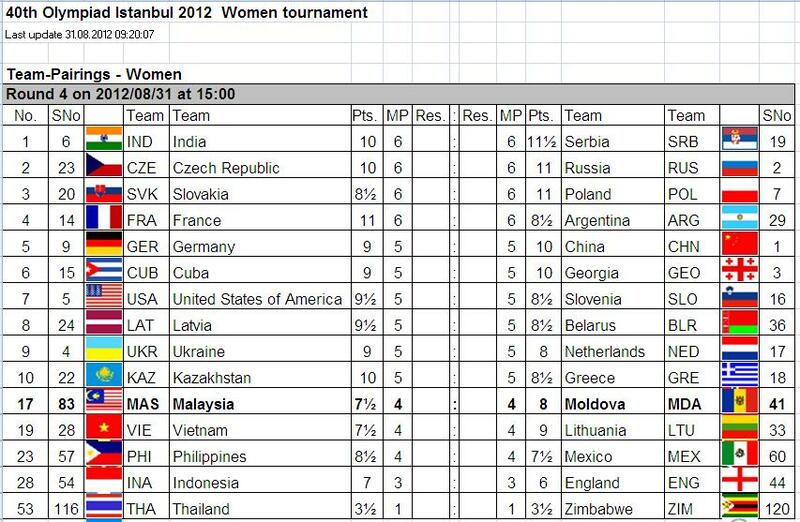 Two years ago in Russia, Malaysia is placed 64th out of 115 teams. China which is led by GM Hou Yi Fan is the top seed in the 40th olympiad women tournament. Among the ASEAN countries, Vietnam is ranked the highest at 27th spot. Indonesia and Philippines are ranked 46th and 56th respectively. GiLoCatur hopes that Malaysia will at least face one of the three ASEAN nations to see where Malaysia stand among the four ASEAN countries. It is a puzzle for GiLoCatur that WGM Irene Iskandar is not taking part in this edition of chess olympiad. 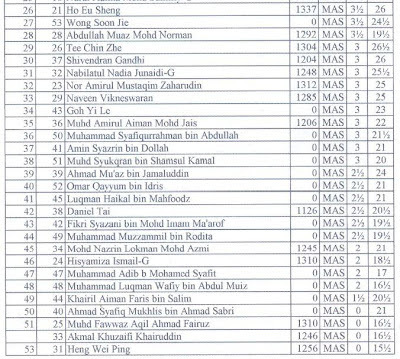 Malaysian previous three chess olympiads 1st board player, IM Mas Hafizulhelmi, is skipping the 40th Chess Olympiad. In this 40th Istanbul Chess Olympiad, the Malaysian men's team is captained by IM Jimmy Liew who is making his 8th appearance. The other four team members are IM Mok Tze-Meng, IM Lim Yee Weng, Yeoh Li Tian and NM Lim Zhuo Ren. Both Li Tian and Zhuo Ren are playing for the first time in the Chess Olympiad. The Malaysian men's team is ranked 86th from the total of 158 teams. The chess enthusiasts all over the world will have eleven days of chess excitement starting today at 8 o'clock Malaysian time watching the world best chess players fighting over chess boards. GiLoCatur would like to say SELAMAT BERJUANG to all the Malaysian chess players. MALAYSIA BOLEH! The update and results on the 2012 Istanbul Chess Olympiad can be viewed here. 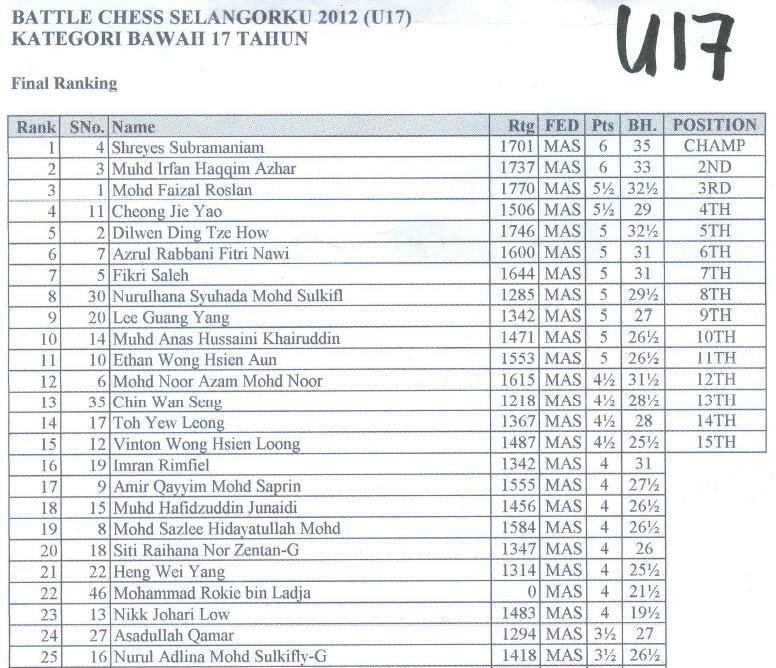 Ilham had his story in the Battle Chess Selangorku in his blog as per here. GiLoCatur asked Ilham what his target in the tournament. He simply answered that the results should be better than his starting rank of 24th. Indeed his final ranking was much better when he won ninth position from six wins, one draw and one defeat to GiLoCatur's first round opponent, Efren Bagamasbad. Now, let's GiLoCatur tells his story playing in the Piala MB Selangor chess tournament. Had GiLoCatur achieved his target to improve his national rating? NO is the answer. Because GiLoCatur was unfortunate to play against only two rated opponents of the total eight - the first and the last ones. In the first round, GiLoCatur was playing at the fourth table. The opponent to beat is a Filipino player in the name of Efren Bagamasbad whose rating is 2069. It is an achievement for GiLoCatur for not losing badly or made stupid blunder. It was not an easy win for the Filipino player. In the second round, GiLoCatur played black against an opponent who came all the way from Pahang. His name is Hamzah Abd Rahman who GiLoCatur had lost in two consecutive Temerloh Open editions - 2008 and 2009. It is quite frustrating since GiLoCatur could not win the match. And it is not a good start to improve the rating. 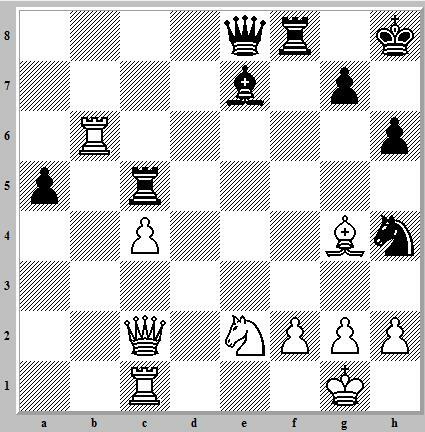 It is very hard to win if your opponent has five pawns when you have only one. GiLoCatur made inaccurate move during the opening stage. 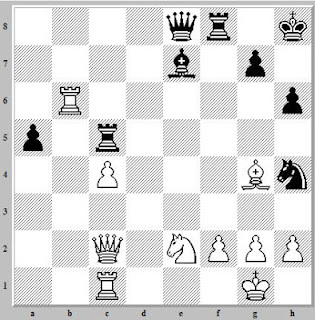 Below is the final position of the game. Four years ago, when GiLoCatur had national rating below 1000, Hamzah easily defeated GiLoCatur after having bad moves during the opening. 6. .. Be6 is the bad move. Bh5 or Qe7 should be better. About one year later, once again GiLoCatur met Hamzah in the same tournament. This time GiLoCatur played white. GiLoCatur fought hard but not enough to win the game. Hamzah was going for revenge since Fikri had defeated him in the earlier round. Back to the Battle Chess Selangorku tournament, after losing to Hamzah, GiLoCatur lost again in the third round. It means GiLoCatur had three game losing streak. In the next round, GiLoCatur had a walk-over win. After the break when the fourth round completed, GiLoCatur had a three consecutive wins. The 7th round win was the best game for GiLoCatur. GiLoCatur saw an opportunity to make a rook sacrifice and cruised to sweet victory. Actually, GiLoCatur did not really had ample time to make a thorough calculation. GiLoCatur just took the risk. Luckily, it went alright. For sure GiLoCatur really had fun playing in the tournament. GiLoCatur is confident that many others like Ilham also felt the same, except one of GiLoCatur's chess buddies, Fauzi Ahim he he he ... Why? Because he had 1/2 point less than GiLoCatur and had much lower final ranking. So, what's your story in the tournament? Fifty three chess players aged between 13 and 17 years old took part in the Under 17 (U17) section of "Piala MB Selangor" chess tournament yesterday. They battled seven rounds of rapid chess games. Who emerged as the champion? Who are the fifteen winners in this category? With 6/7 points and better tie break, Shreyes Subramaniam, the 4th seed, became the champion in the Under 17 section. The first runner up is Muhd Irfan Haqqim Azhar who also scored 6/7 points. 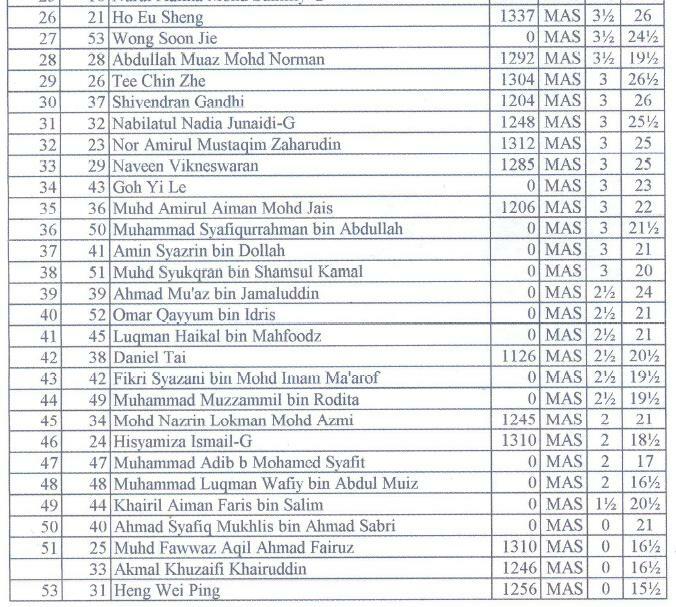 The top seed, Faizal Roslan, just managed the third spot with 5.5 / 7 points edging the other 5.5 pointer, Cheong Jie Yao. How about GiLoCatur's eldest son, Fikri? Fikri scored 5/7 points after losing two games to both Faizal and Irfan. Check out below final ranking and several photos of the U17 category. Congratulation to all the winners! To others who did not win, DO NOT GIVE UP! Keep learning and practising chess. WOW! 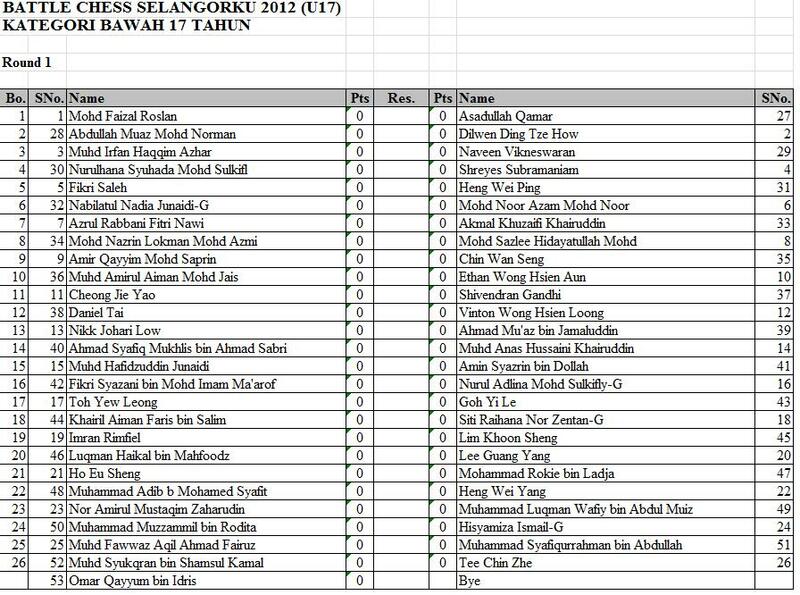 That's what GiLoCatur can say about the participants list of the Open category in the "Battle Chess Selangorku" tournament. 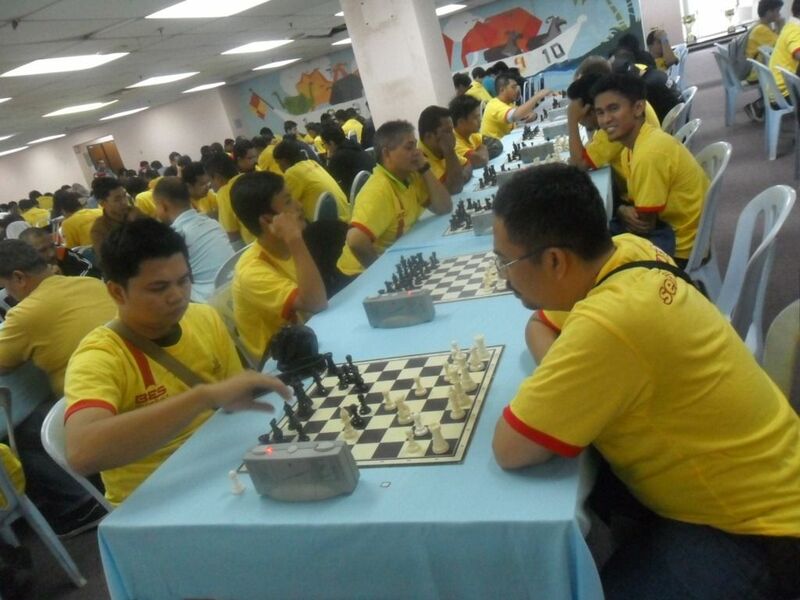 An amazing 175 chess players including several Pinoy chess masters are taking part. It will be a tough chess tournament especially to GiLoCatur, the 91st seed. One aim for GiLoCatur to play in this tournament is to improve the national rating. GiLoCatur has the national rating of 1443. Will GiLoCatur succeed in such endeavour? Looking at the first round pairing here, GiLoCatur really has a tough first round opponent. As per above pairings, GiLoCatur is paired against the 4th seed and a Pinoy chess master, Efren Bagamasbad. It will be an amazing experience to play with such opponent. It will be interesting to find out later "How long GiLoCatur will be able to hold him" ... ha ha ha. If you notice, three out of the the top four seeds are Filipino chess players. IM Rolando Nolte who won this year edition of the Selangor Open in last May is topping the list. Will he cruise all the way to the end thrashing all his opponents? Or can Malaysian-based Filipino Ian Udani, ranked second, OR FM Dr Ronnie, the highest-rank Malaysian OR GiLocatur's first-round opponent, Efren Bagamasbad stop the sole International Master in the tournament? OR would it be Kamaluddin Yusof aka Abang Bro with his mamak tricks to emerge as the champion? Let's wait for six hours for the chess fight to begin! GOOD LUCK to all the participants who will fight in the much awaited BATTLE CHESS SELANGORKU! SEE YOU THERE! 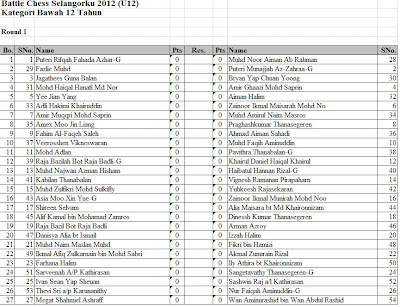 In Under 17 section, there are 53 participants competing to win the trophy and MYR 250 winning prize money. Leading the pack is Faizal Roslan, who led his Undefined FC team to win the (Under 17) Junior Kasugi Team chess championship last month. Faizal will be challenged especially by his Undefined FC team mate, Fikri Saleh, Dilwen, Irfan Haqqim, Shreyes Subramaniam, Noor Azam and the Wong brothers - Vinton and Ethan. All these players are basically the MSS state chess players. Can Faizal live up to his top seed billing to eliminate all his tough challengers? GiLoCatur is very also interested to find out the challenge put up by several other contenders like Lee Guang Yang, Amir Qayyim, Cheong Jie Yao, Sazlee Hidayatullah and Nikk Johari Low. Let's see their Round 1 pairings. Faizal is paired against Asadullah Qamar at the top table. Dilwen will play black against the 28th seed opponent, Abdullah Muaz. Irfan Haqqim, the third rank, is paired against Naveen Vikneswaran. Shreyes of Pahang will be challenged by MSS Selangor state player, Nurulhana Syuhada at the fourth table. Fikri, GiLoCatur's eldest son, is ranked fifth and will play against Heng Wei Ping. GiLoCatur has not mentioned any girl player in the top contenders list, right. It is because the top girl players like the Azman sisters - WCM Nur Nabila and WFM Nur Najiha, are playing in the Open section. Furthermore, not many girls are taking part in this tournament. So, it is a challenge to all the girl participants in the Under 17 category to prove their strength and power to be among the winners. The much awaited "Battle Chess Selangorku" has already coming. The chess battle will start at 9.00am this morning (Saturday, 11th August 2012). The first round pairings had already been published in the stonemaster.info website. Let's check out the Under 12 category first. GiLoCatur's youngest son, Fahim Al-Faqeh, will take part in this category. He has not taken part in a chess tournament for almost a month. 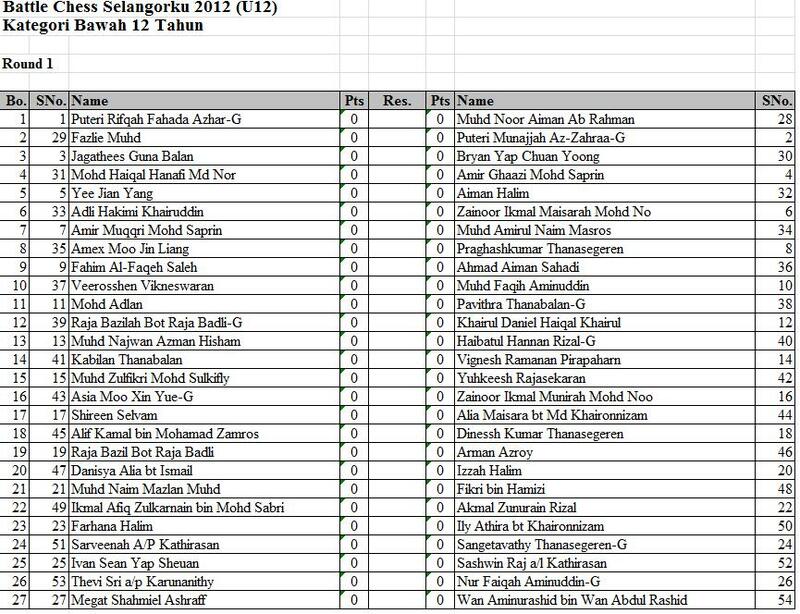 With the national ratings of 1398, Fahim is ranked or seeded 9th out of 54 total participants in the U12 category. As per below Round 1 pairings, Fahim will play white against Ahmad Aiman Sahadi. Fahim should not take for granted his lower-rated opponent. Because Ahmad Aiman is of the Sahadi chess family. Based on the players listing, the hot favourites to win this category are the Puteri sisters - Rifqah and Munajjah. The challengers, as GiLoCatur sees it, would be the Saprin brothers - Amir Ghaazi and Amir Muqqri, fourth and seventh rank respectively, the Halim sisters - Izzah and Farhana, MSS Selangor U12 players - Zainoor Ikmal Maisarah, Faqih Aminuddin and Yee Jian Yang. It has been more than a year when the Bongsu Trios participated together in one chess tournament. Do you know who they are? :)- Find it out here. GiLoCatur is very eager to wait their final performances and results. Will they run around and make havoc during the tournament? GiLoCatur hopes the Bongsu Trios will focus on their games and be on the podium receiving their winning prizes. 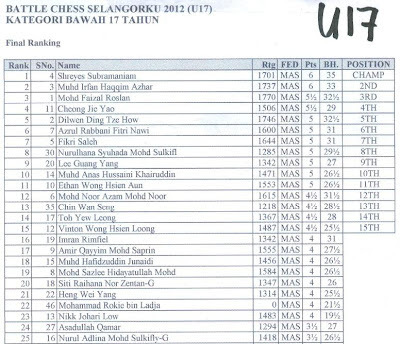 The venue of the upcoming chess tournament, "Battle Chess Selangorku", has been changed from ICT in Section 7 to the old Raja Tun Uda Library (PPAS) in Section 14, Shah Alam. It is both bad news and good news for GiLoCatur. It is a bad news because the dream of playing chess at ICT has been dashed. And it is a good news because it will be a nostalgia for GiLoCatur to play at the new venue. 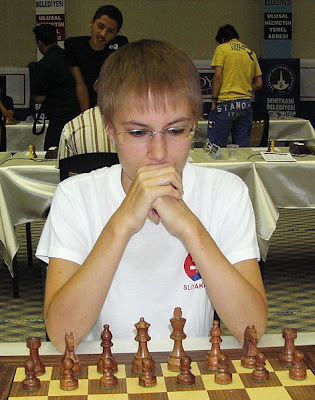 GiLoCatur had played at the library way back in 1988 at the age of 20 years old. It is the only chess tournament that GiLoCatur had the certificate of attendance at the time. 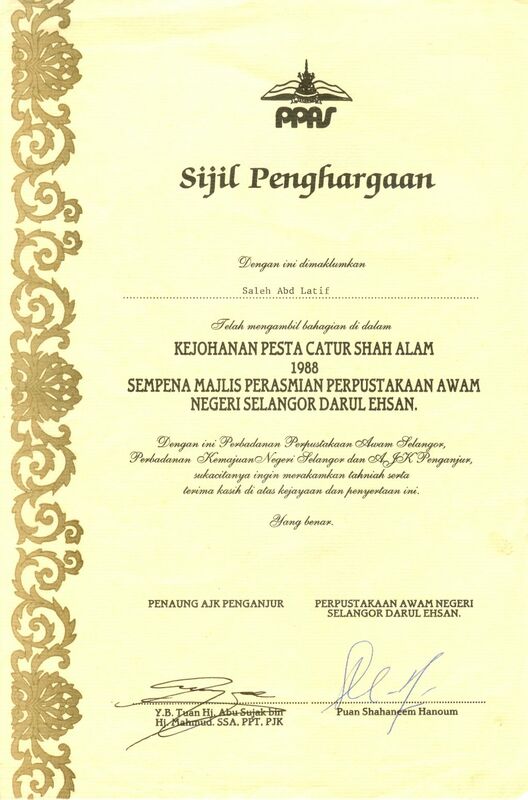 The certificate is still in good condition even though GiLoCatur had kept it for almost 24 years. Hey, it is not only CM Fadli aka stonemaster keeps an old chess tournament certificate of attendance as per his blog entry. GiLoCatur does as well. Actually, GiLoCatur does not realize that GiLoCatur was really crazy about chess when young. In the first resume back in early 1992, GiLoCatur had stated playing chess as the first of three hobbies. So, GiLoCatur can't wait to participate in the upcoming Battle Chess Selangorku tournament. CAN YOU?